Over the years, I’ve been fortunate enough to travel to a number of destinations in various parts of the world. Like most travelers, all my experiences on the road have helped me to formulate an idea of the characteristics of my “perfect destination.” So far, that list includes traits like a mountainous landscape, large diversity of plants and animals, earnest and friendly locals, great food, and that elusive sense of foreignness. While obviously not perfect, I have visited few places, which better match my list of ideal qualities than Northern Thailand. This post begins in Chiang Mai, where most travelers, including myself, are introduced to the beauty of this region. Often referred to as the rose of the north, Chiang Mai’s defining feature is the crumbling remains of an ancient wall and moat, which quarantine the old city. Though this area is called the old city, not much besides the temples are actually very old. Instead, travelers tend to find this area an artistic and chic part of town, and it’s not surprising that Chiang Mai’s old city is home to a surprising number of expats. Even in the middle of Chiang Mai, nature is celebrated. 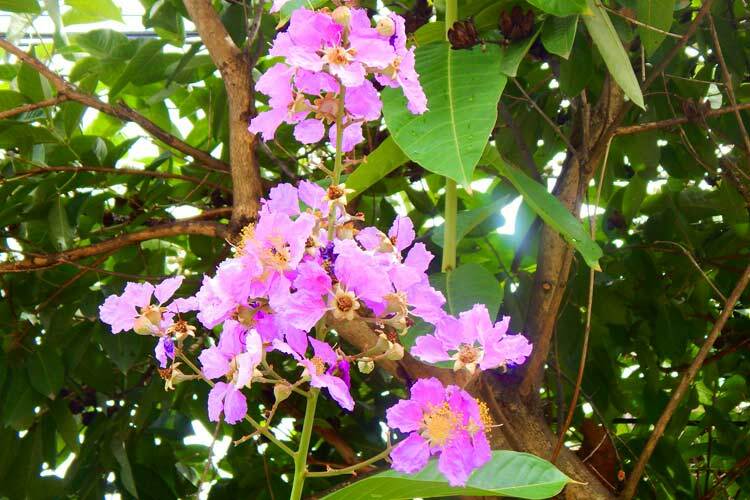 The city features flowers in every nook and cranny, as well as a fantastic park in the southwestern corner of the old city. 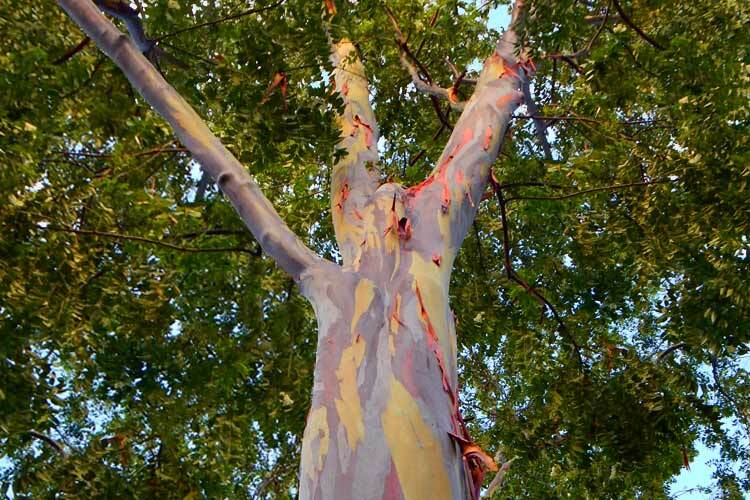 The crowning glory of this park is undoubtedly the pair of rainbow eucalyptus trees, Eucalyptus deglupta. Although we quite enjoyed our stay in Chiang Mai, by the time we left, we felt ready to get out into nature. After all, a quick review of my list of attributes of the “perfect destination” reveals that I tend to like more remote, natural vacation spots over bustling cities. Fortunately, we soon heard rave reviews from other travelers about the town of Pai, near Thailand-Burma border. As we soon found out, hearing about Pai and actually visiting the place are two entirely different concepts. According to the locals, Pai is located only about 31 miles or so as the crow flies, but one must drive almost 70 miles over densely jungled mountains by car along the infamous Highway 1095. This motion sickness-inducing journey takes one through 762 sharp turns, which accounts for the increased distance. Being the cheap travelers we are, we opted to undertake this journey in a rickety 12-person van, so it’s needless to say we felt a bit queasy once we finally arrived some three hours later. Though Pai is definitely not the sleepy farming town it was ten years ago, the enormous influx of tourists has done little to tarnish its charm. The town is nestled in one of the most picturesque valleys I’ve ever seen, centering around the Pai River. Surrounding the Pai River are a number of smaller tributaries, which carve their way through the formidable 4500 foot tall mountains with a series of drops and waterfalls. These mountains are the far eastern tip of the Himalayas, though they differ substantially from the more famous Himalayan giants like Everest and K2. 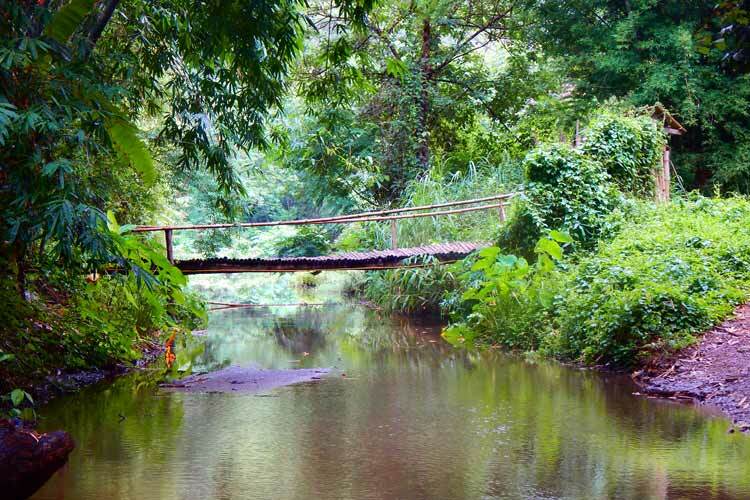 The mountains surrounding Pai are densely coated in jungle, making them perfect for hikes. We opted first to visit Mae Sen waterfall, which can only be reached through a poorly maintained trail through the jungle, along (and often directly in) one of the river’s tributaries. Despite this being one of the rougher hikes we’ve ever taken, it’s safe to say we were thrilled to be out in north Thailand’s great outdoors, familiarizing ourselves with new species of plants and animals. One of the things we found most fascinating about learning new plants is seeing the natural homes of invasive plants. Back home in North America, people have both purposefully and accidentally imported a number of plants from Southeast Asia, which have proved to be invasive, such as bamboo. Invasive plants are able to thrive and outcompete natural species in the North America because they lack natural competitors and restraints. Frequent travelers may already be aware of this phenomenon, as it’s the reason nearly every country checks for plants, animals, or other natural products when you enter through customs. It was fascinating for us getting to see invasive plants growing in a healthy manner in their natural habitat. 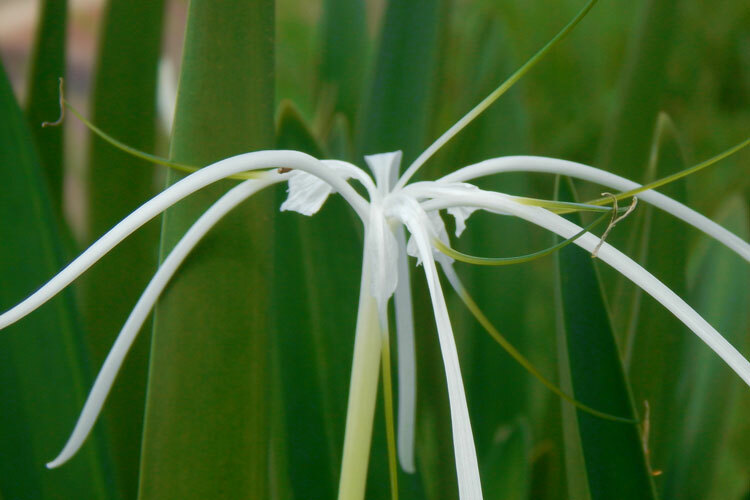 It was also a bit worrying seeing New World plants, such as the following spider lily (Hymenocallis caribaea), being planted very commonly by the Thai people. Though Pai featured large swaths of remarkably well-preserved wilderness, the town is primarily a farming town, and huge swaths of the valley are sectioned for rice farming. Fortunately, farmers tend to be to honest, friendly folk, meaning they still fit within my list of traits for an ideal destination. Be sure and check back for next week’s article, when I discuss the deep connection between the land and the people of northern Thailand.